So the answer is yes, you can boost your productivity with multiple screens but indirectly. If you become more efficient with your mundane, repetitive tasks through the use of multiple screens, you will have more time to invest in high-priority activities that will move your business forward. 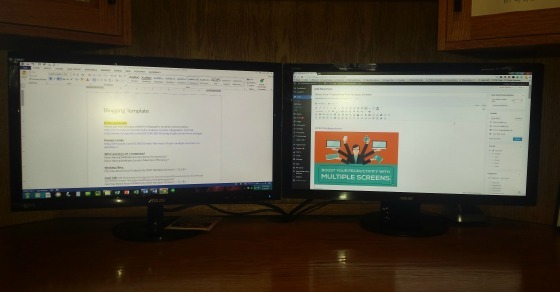 I personally use two monitors and cannot imagine ever working without them. They enable me to be much more efficient and effective. Since I work primarily from my task list, I usually have my calendar and task list open on one screen and the task or project I’m working on open on the other screen. This system supports my workflow and ability to stay focused on my tasks and goals for the day. Would it work for you? Depending on your job description, you may be better off having your research on one screen and a spreadsheet on the other. Use whatever system assists your workflow the best. Another way I use multiple screens is to write content on one screen while having another open strictly for research. In the image of my monitors above, I am writing this article in my blog template on the left and working inside WordPress on the right. Doing so enables me to easily reference the infographic for statistics and information while continuing to write content on the other screen, all without having to switch back and forth from one tab to the other. Find a set-up that works best for your workflow and your business. Using multiple screens can have a downside if you are not careful because it may entice you to attempt multitasking which would affect your focus. All those who pursue the art of multitasking only fall victim to it. The benefits you could possibly gain by working from multiple screens would be lost if you attempt to multitask. 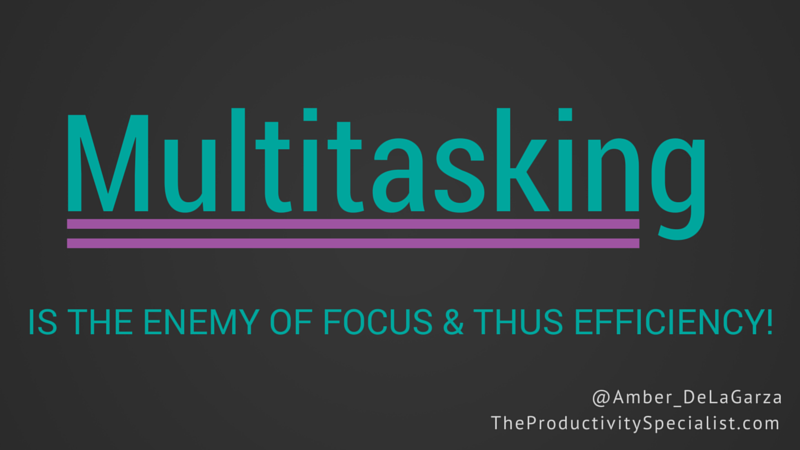 Read my article to find out why multitasking is your foe instead of your friend. Another false assumption you might make when you start using multiple screens is that you can keep your email open on one screen while attempting to work on the other screen. Please do NOT do this! You would only fall prey to everyone else’s requests of you with every new email in your inbox. The goal is to boost your productivity with multiple screens, not sabotage you with more distractions. Instead of reactively checking your emails throughout the day, I urge you to proactively process your emails at scheduled times each day. You can boost your productivity with multiple screens but only by using them wisely. Reallocate the time gained by taking advantage of multiple screens toward your best activities, those that bring you closer to achieving your goals and vision of success. If you are ready to take your efficiency and productivity to the next level, read Make the Most of Your Multiple Monitors in Windows from Lifehacker. Below is an infographic created by Web Hosting Reviews. It shows research-backed tips that indicate you can boost your productivity with multiple screens.